Ooof. Too many things to do and not enough time to do them, right? I should have posted this post yesterday, but well, you know. This past Sunday was my annual “Great Cookie Bake Off”. Every year I bake dozens of cookies and package them up with some of my hits from the canning season and mail them off. 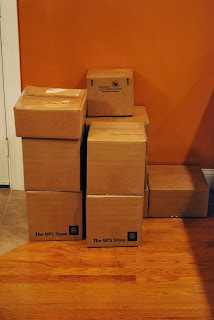 This is truly a labor of love, as I average anywhere from 10 to 20 boxes to send out. At this point in my friend’s and family’s lives, more stuff is not necessarily more. We all have everything we need. Cookies and home canned goodies with the occasional gift card are more appreciated and welcomed. But how do you wrap up those jeweled jars to send to loved ones safely? I’ve been sending canned goodies to loved ones for almost 10 years and have not had a jar break or spill yet (knock on wood). It’s a little tedious, but it’s better to be safe than sorry. You know how I feel about peel-and-stick labels stuck to jars. 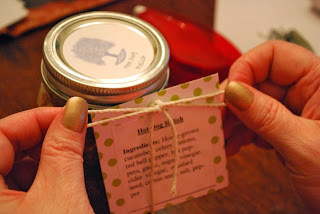 They’re a complete pain to get off if you want to use the jars again, so I use round Avery labels on the lids and I make a hanging tag to include the jar’s ingredients. 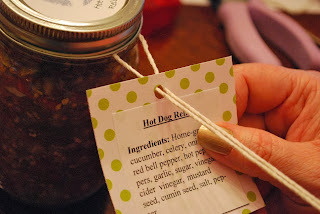 Over the years, I’ve dabbled in about every way possible to make cute, functional hanging tags and this method is the one I’m sticking with. First, be sure to put bands on your jars. 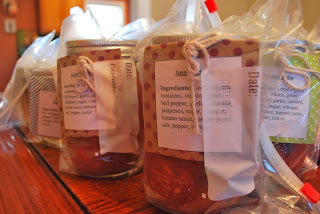 I prefer to use new or my “non-processing” bands so the jars can look as pretty and presentable as possible. 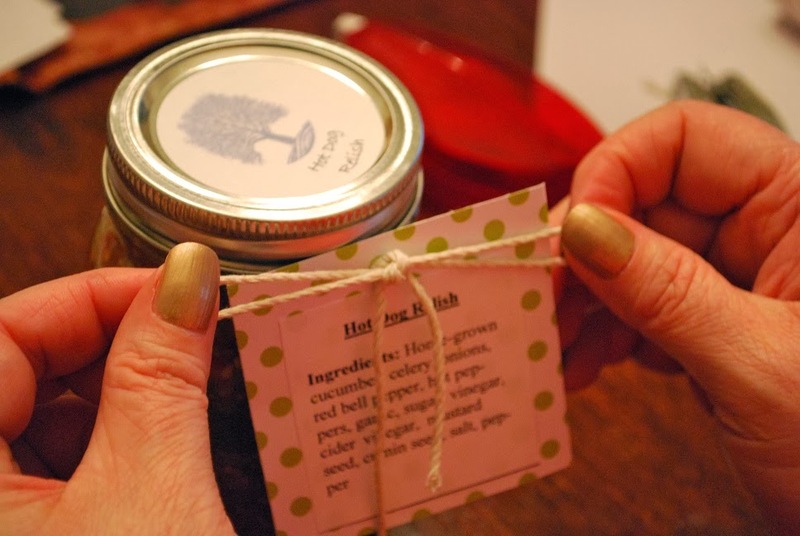 Nobody wants a gifted jar of canned food that looks like it might give them tetanus! You don’t need to wrench down the band, but a little tighter than “finger tight”. 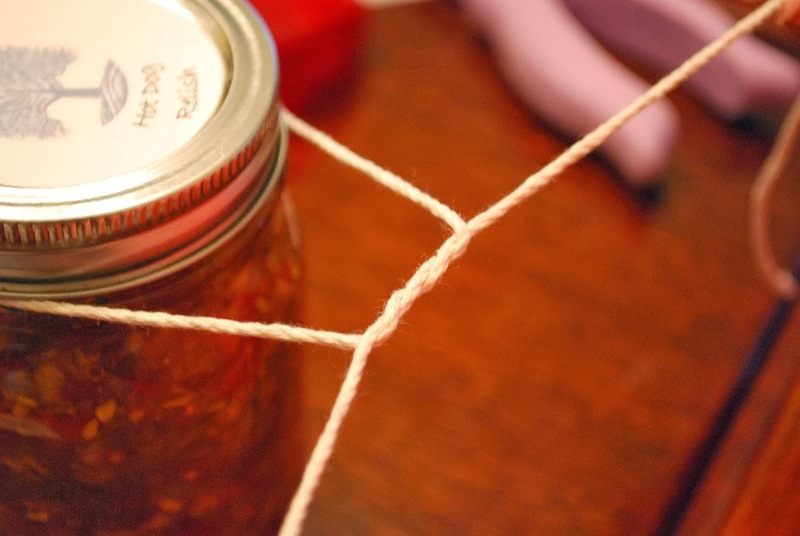 Second, you will need some cotton string (not nylon) or even yarn. Ribbons work too, but not the satin ones or any that have a slippery material. Basically, you want the material to be able to “grab” onto itself. I cut off about an 18” piece and wrap it around the jar itself just under the band. I’ve tried wrapping the string around the band itself, but it slips off the top. Next, tie what I call a “chef’s knot” in the string. I use this knot when I’m trussing poultry or roasts. It’s basically a double over-hand (or under-hand) knot that keeps the knot from slipping (think of the first knot you do when you tie your shoe). 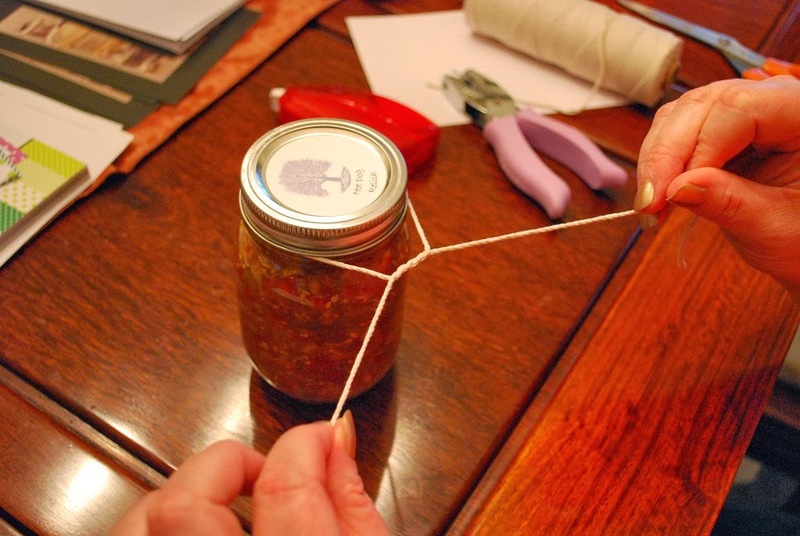 Tie with this knot tightly to the jar; it should stay in place. Third, slip both ends of the string through your tag. I made my own tags with scrapbook paper and printed ingredient’s lists, but you can use store-bought tags or whatever floats your boat. Have a single hole punch on hand in case you need one. Fourth, tie a simple bow (like tying your shoe). And last, tie that bow in a double knot (another over/under-hand). This keeps the tag from sliding off the string and it also keeps the string from coming untied. This method also ensures your tag will hang straight and not twist around sideways. 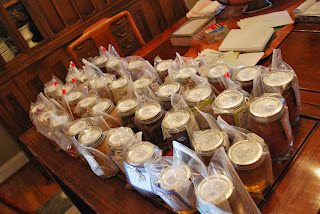 Okay, now that we have all our jars labeled and cute, it’s time to get them ready for shipping. I always, always, always put my jars inside either a quart-sized (pints) or gallon (quarts) Ziplock bag. Again, I’ve never had a jar break or lose a seal, but it’s better to be safe than sorry. If a seal should break, the bag will hopefully keep it contained and not damage the rest of the box’s contents. I also try to push as much air out the bag before closing. Next, I use bubble wrap (the perforated type) to completely wrap around the now bagged jar and use packing tape to hold it in place. If there is a lot of air in the Ziplock bag, the jar will kind of jiggle around inside an air pocket and the bubble wrap won’t be as effective. 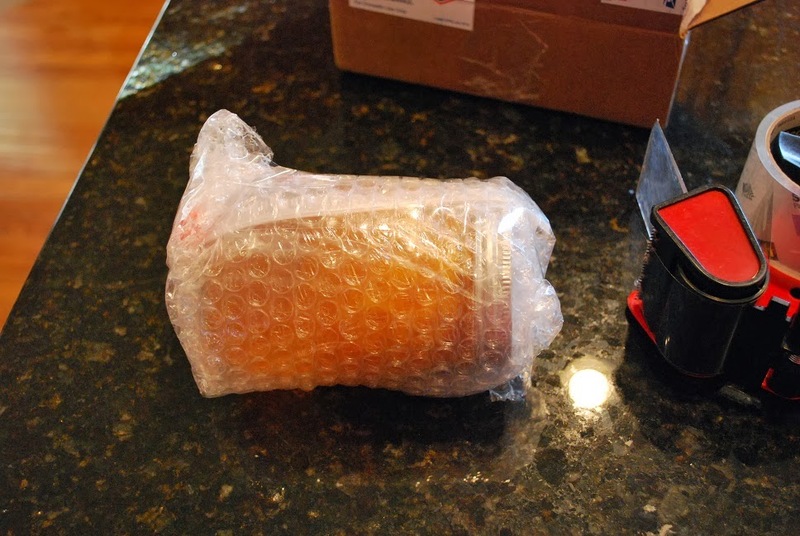 You want the bubble wrap to have as much solid contact with the jar/bag as possible. Tight packing equals less potential damage. Whew! After all that, I get my boxes ready by first putting a layer or two of bubble wrap on the bottom of each box. I usually lay my jars sideways as the bubble wrap make them unstable. I put bubble wrap or crumpled newspaper between the jars and the walls of the boxes. 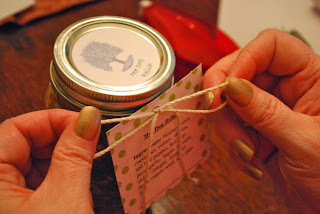 Depending on how many jars I’m sending, I usually just lay the jars next to each other side-by-side and put more bubble wrap or crumpled newspaper on top before sealing the box. When I close up the box, I make sure the box is packed tight and there are no air-pockets for things to shift around and get damaged. Looks like we’re moving, huh? Like I said, this is a labor of love. Each one of these boxes have anywhere from 2-6 jars of canned goods and a box of cookies. Now I am going to take a nap! As far as how to send them out, I use UPS. I have found through painful experience how expensive shipping through the United States Postal Service can be. I have also found that some UPS shipping locations are a little unpredictable on what they say is "allowable" for shipping. Sometimes I tell them the boxes have jelly and jams in them and they are okay, others not, so now I just tell them they are "Christmas gifts". I know that's a little sneaky, but there's nothing more frustrating than to go to one UPS location to have them say "Yes" and another location say "No". Ain't nobody got time for that!